December 19, 2015: As submitted to the Village by C.T. Male Associates, project engineers. DOH review and approval process estimated at 2-4 weeks. System operational 8-9 months after DOH approval. December 18, 2015: In an effort to keep residents better informed of the water situation, a letter has been drafted by the mayor that is being mailed to Village households and Town municipal water users. The letter will also include the December 17, 2015 press release by the EPA on the water situation. The press release can be read below, the cover letter can be downloaded here. Residents can expect to receive the letter and EPA statement early next week. In an effort to reach as many residents as possible, it is also being shared here and other media outlets. The New York State Department of Health has also developed an updated PFOA Fact Sheet for the village. December 17, 2015: Recently, members of the Hoosick Falls community have contacted the U.S. Environmental Protection Agency (EPA) with concerns and questions about whether they should drink, bathe in, or cook with their water, which has been found to contain perfluorooctanoic acid (PFOA). PFOA is a manmade chemical that is toxic and persistent in the environment. It is used as a surface-active agent and in variety of products, such as fire-fighting foams, coating additives and cleaning products. While the EPA continues to gather information and assess the Hoosick Falls water contamination, it recommends that people NOT drink the water from the Hoosick Falls public water supply or use it for cooking. There is a lack of studies evaluating the human health effects from inhalation and skin exposure to PFOA. The EPA believes that inhalation of PFOA contaminated water (for example, from showering or bathing) is not a significant exposure. PFOA has a much higher boiling point (372.2°F) than water (212°F), is a solid with a very low evaporation rate at room temperature, and any inhalation of the steam-like, aerosolized, PFOA-contaminated water droplets generated while showering or bathing is not a significant exposure. Similar to inhalation exposure, the EPA also believes that skin contact with PFOA-contaminated water from the public water supply in Hoosick Falls is not a significant exposure. Studies have demonstrated very limited absorption of PFOA through the skin, and the uptake of PFOA through the skin is extremely slow. As a precautionary measure and given the limited information on dermal exposure, children or people with skin conditions (for example, rashes, cuts and abrasions) should avoid prolonged contact (such as long showers or long baths) with PFOA-contaminated water. The EPA is continuing to gather information and will keep the public informed. Public inquiries can be directed to Larisa Romanowski via email or call 518-407-0400. December 10, 2015: On December 3rd 2015 the Village sponsored an informational session concerning the ongoing situation with the discovery of the unregulated contaminant PFOA in the wells of our municipal water system. Representatives from regulatory agencies, local government, and other involved parties were there to answer questions and distribute literature. It was reasonably well attended, and we trust that attendees became better informed. The village received a letter from the EPA prior to that meeting where the agency provided recommendations of best-practices for us to follow. Also in the letter were references to where the EPA’s information regarding PFOA can be accessed online. The New York State Department of Health also prepared a fact sheet for the session. Links to these documents are below for your convenience. We advise all concerned citizens of the Village to read this and other available literature to remain up to date on the PFOA situation. EPA letter to the Village. EPA Emerging Contaminants (PFOA PFOS) Fact Sheet—March 2014. NYS DOH PFOA in Drinking Water Fact Sheet. 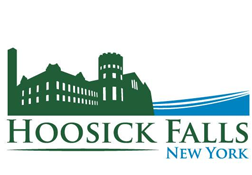 As presented at the Hoosick Falls Village Board meeting on Tuesday, November 10, 2015, Saint-Gobain Performance Plastics is providing funding for an alternative source for drinking water for those Hoosick residents connected to the Hoosick Falls Municipal Water System. Should residents choose this option, bottled water will be available at Tops Market in Hoosick Falls at no cost to residents on the municipal water system as of Sunday, November 29, 2015. Only 1 gallon and 2.5 gallon containers of select brands of water will be available at no cost (no water in redeemable bottles). 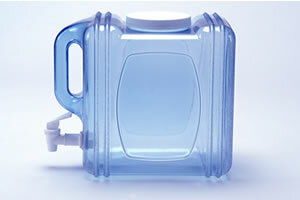 A maximum of 5 gallons per day per household will be available at no cost. Sign in at the Service Desk at the Tops Market in Hoosick Falls first to receive a coupon(s) to be used at the checkout register. Tops Market in Hoosick Falls is open 7 days per week. A pilot study has been completed and it has been determined that Granulated Activated Carbon (GAC) is effective in reducing the amount of perfluorooctanoic acid (PFOA) to unmeasurable levels for our specific water supply. This technology exists and is recognized as effective by Rensselaer County Department of Health and NYS Department of Health. NYS DoH has agreed to analyze water samples on an on-going basis at no charge to the community. Additionally, samples have been taken from privately owned wells in the surrounding area to investigate the extent of the contamination to see whether the contamination is localized, or broader in scope. Again, I ask that anyone who has had water samples privately analyzed, to please provide copies of specific results to the Village Clerk’s Office. This information will be used by the County and NY State Departments of Public Health to determine the most effective long term mitigation plans for our community water supply. The Village Board has approved an agreement with the MRB Planning/Engineering Group to provide an engineering report which will summarize the specifics of our water concerns, and which verifies that the correct steps are being taken toward a successful resolution. This report is also required by all potential funding sources – whether they are state, federal or private sources. Several conversations with staff from the offices of Senators Schumer and Gillibrand, Congressman Gibson, as well as direct discussions with Senator Marchione and Assemblyman McLaughlin regarding federal and state sources for funding have occurred. The issue remains that until the Federal EPA completes its current data gathering process regarding PFOA and makes a determination, this man-made substance remains officially an “unregulated contaminant” and therefore, rules, regulations or enforceable standards for levels in drinking water do not exist. Both the Village Water Treatment Plant and the Waste Water Plant continue to meet and exceed all county, state and federal regulations. We are in compliance in all areas. Discussions have also taken place with the regional representative from the Governor’s Office. There will be more communications as we continue to move forward. To date, our efforts have been focused on finding a practical and feasible way to minimize and or eliminate PFOA from our water supply. 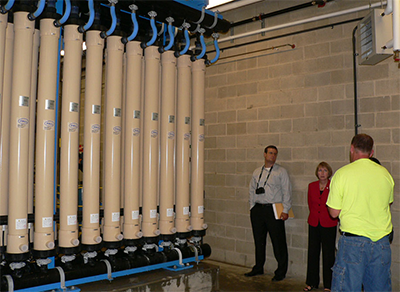 The addition of a secondary filtration system using GAC technology is the route we will pursue. Efforts are being made to secure funding at all levels. There is a regulated process with specific time frames to follow and the Village Board has directed MRB to initiate that process. At the regular July meeting of the Village Board, representatives from Saint- Gobain presented their plans to support the collaborative efforts of our community in working toward a successful resolution. We consider this a positive step. They have retained C. T. Male Engineering to do a hydrogeologic study of the McCaffery Street property. The results of this study will be shared with the community as we move forward. We hope to have the results from this effort by the Fall of 2015. Since October of 2014 to the present, the financial cost to the Village has been in excess of $63,000. The estimated cost to add the secondary GAC filtration system is approximately $2,200,000 for initial construction not including routine maintenance. Although the Village is financially solvent, other funding sources will be required to meet this need. Rest assured that the Village Board is working diligently to resolve this issue and is committed to restoring the public’s confidence in our municipal water supply. Your patience is appreciated, we share your concern, and you will continue to be updated as to the progress made. Suggestions or comments can be forwarded to me at themayorhf@gmail.com or messages left at 686-7072 ext. 5. There will be a informational/sign-up event at the Armory on Wednesday 5/20 from 5-8pm to bring reliable broadband service to Hoosick. This is important for both residents and business development in the town. BOUNCELINX, a Greenwich, NY based fixed wireless Internet provider, has offered to bring high speed broadband service to The Town of Hoosick. Conditions: Because of the large capital outlay ($500,000+) to offer service to all Hoosick residents who do not have cable or fiber options, BOUNCELINX needs a large group of sign-ups for service before committing to 100% coverage. BOUNCELINX needs 300 sign-ups by May 31st in order to begin its build-out in Hoosick. As an incentive to encourage these sign-ups, BOUNCELINX has offered to waive its standard $199 installation charge for the first 100 Town of Hoosick businesses or residences. Background: Most of the residents within the Town of Hoosick but outside of the Village of Hoosick Falls have limited access to the Internet because their options are limited to dial up, DSL, satellite or cell phone hot spots. All of these suffer from limitations of speed, data, connectivity or price, and the large cable and telephone companies have been unwilling to outlay the huge amounts of money to connect rural areas with cable or fiber. Today's solution to this problem is fixed wireless technology, which has been called "fiber in the sky" because the data transmission can match the capability of fiber optic cable. Advantages to our community: Universal broadband access in the Town of Hoosick has the potential to boost our town and surrounding areas into a new era of prosperity and relevance in today's world. Businesses will have the connections that are vital for them and residents will be able to cut their costs for Internet, telephone and entertainment. BOUNCELINX offers multiple plans with prices starting at $49 per month. A critical advantage to the BOUNCELINX technology is that it is land based and is not affected by weather like satellite, provides dedicated service and has very low latency. BOUNCELINX does not charge you if you go over your plan - if you exceed your selected plan BOUNCELINX will slow your service till the monthly reset. This ensures that you can always stay within your budget. BOUNCELINX has offered to completely fund and build out a high speed broadband network this year, provided that enough interest can be generated. The presence of perfluorooctanoic acid (PFOA) at the levels detected in the supply wells and in finished water does not constitute an immediate health hazard. Based on specific toxicity information for PFOA, the estimated exposure to PFOA in the water at the highest level detected (0.54 µg/L) is at least 50,000 times lower than PFOA exposures that are known to cause health effects in animals. The detection of PFOA indicates a need to identify the sources of contamination and to take measures to reduce it so that long-term exposure can be reduced and future exposures prevented. Samples taken from the water supply wells on October 2 and November 4, 2014 were found to contain PFOA at levels ranging from 0.17 micrograms per liter (µg/L) to 0.54 µg/L. One sample of finished (treated) water taken on November 4th contained PFOA at 0.44 µg/L. These levels are below the New York State unspecified organic contaminant public drinking water standard of 50 µg/L, which applies to certain types of organic chemicals such as PFOA, which do not have a standard based on their toxicity. Information on the health effects of PFOA in humans is limited. There is evidence from studies in people that elevated levels of PFOA in serum can lead to reduced fetal growth. There is also some evidence from studies in humans that increased serum PFOA levels may increase the risk for testicular and kidney cancer, but collectively the studies are not strong enough to draw a definitive conclusion about whether PFOA causes cancer in humans. In laboratory animals, exposure to high levels of PFOA caused weight loss, increased liver weights, developmental delays, reduced red blood cells, and reduced fetal growth. PFOA caused cancer in laboratory animals that were fed large amounts for their lifetimes. Chemicals that cause adverse health effects in animals after high levels of exposure may pose a risk to humans exposed to lower levels over long periods of time. PFOA is a manufactured chemical that is used to make other chemicals called fluoropolymers. Fluoropolymers are substances that have special properties such as fire resistance and the ability to repel oil, grease and water. Thus, they have many manufacturing and industrial applications. PFOA is used to make non-stick surfaces on cookware and in fire-fighting foams, cosmetics, greases, lubricants, paints, polishes, and adhesives. PFOA can get into drinking water through releases from fluoropolymer manufacturing or processing facilities, wastewater treatment plants, and landfills. 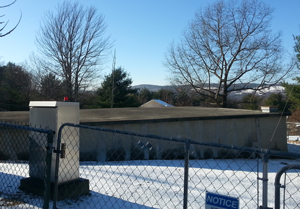 The Village of Hoosick Falls has received a State and Municipal Facilities Program (SAM) grant for $95,000 from the Dormitory Authority of the State of NY (DASNY) to cover the cost of restoring the Rogers Avenue water tank. The grant funding was secured with the help of Senator Marchione's office. The repairs included relining of the interior, repair of cracks, and installation of an isolation valve. These repairs were necessary to keep the tank operational for the forseeable future. The repairs were completed in late 2014. This grant will enable the Village to repurpose some of the funds slated for the project, and also relieve us from having to borrow funds.